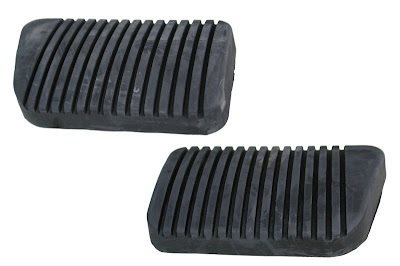 Not too long ago, we introduced the 1964 1/2-early 65 Brake and Clutch Pedal Pads for the early model Mustangs. These are part numbers BK1651 and BK1701. Now we also have the same style early pad available for automatic transmission equipped Mustangs. The part number is BK1641. You may be thinking, what makes the early ones different? Well, these early pedal pads did not have the groove around the outside for the stainless steel trim that was used on the deluxe (Pony) interior equipped cars. As Mustang restorations get more and more "correct," these pads become an important detail in putting together a really nice car. 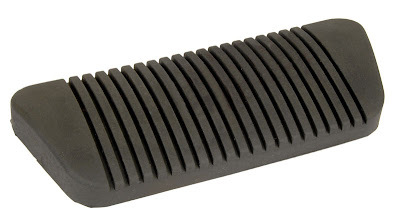 Before these parts were introduced, it was just extremely difficult to find used early pedal pads that were not cracked, worn, hard and just not usable.